The Samsung 243T display showed good gray scale shading. The white scale bars were clear and contrasted well with the black test background. It was difficult to see a perceptible change between 1% and 2% black test bars. Overall, the 243T's 500:1 contrast ratio translated into almost jet-black backgrounds and brilliant white text which was great to see. Minute shading changes seemed to be a bit of an issue, as the black shading test bards blended together into an almost uniform gray when viewed from more than a 45 degree angle. Colour vibrancy was excellent on the 243T. The all white screen faded into an off-white at more than 45 degrees again, but when viewed centrally the brightness appeared to be uniform, which is good. The red, green and blue test screens were very bright and the colour saturation was excellent. There were no dull or broken pixels visible, which should be expected from a display of this expense. By displaying a primary colour transition from solid colour to black, it is possible to see one how well the LCD panel handles colour shading. Limited to 16.7 million colours, LCD screens often suffer banding to some degree. The slight transition from one shade to another can lead to a visible 'stepped' appearance. The Syncmaster 243T fairs well here, though slight banding was visible on the green screen test. Resolution is excellent at the native 1920x1200. At a non-native 1280x768, dithering was acceptable despite some slight blurring. If you prefer larger fonts or need to run at a non-native resolution, the 243T will handle text gracefully. When testing the Syncmaster 243T display on its analog input, we saw no visible background noise in any of the moire tests. The 243T we tested did not have a single broken pixel on it - a measure of LCD panel quality we have come to expect when testing Samsung displays. In our tests (at 60Hz) rapidly moving text up and down, no text streaking was visible. As we stated, the 243T did not prove ideal for gaming due to the average (25ms) pixel response times. In our response time test, the SyncMaster 243T showed minor distortion at 600 pixels per second movement and above, but nothing to write home about. This may make gaming slightly less enjoyable than it would be on a comparable CRT monitor, but it will not affect any other usage of the display. We did not experience any degree of frustration or disappointment while testing the Samsung Syncmaster 243T display, and it was generally a joy to use. Of course it's not too often PCSTATS reviews a display with the specifications of this one... but we did catch ourselves loading up favourite desktop backgrounds just to see how they would look on the vast 1920x1600 real estate of the SyncMaster 243T. Using the digital DVI input, brightness, picture quality and sharpness were excellent across the board. The only imperfections were a mildly less than perfect rendering of true black shades in one of the monitor tests, and a general blurring of the darker end of the scale when viewed off-center. The rendering of the transition between grey and white was excellent on this display. Colours were extremely vivid and saturated, while remaining fairly even across the whole screen. The build quality of the Samsung SyncMaster 243T is also excellent. The stand is substantial and does not slip around when the monitor is being adjusted. The pivoting and monitor rotation hinges work effortlessly, making handling this heavy screen very easy. 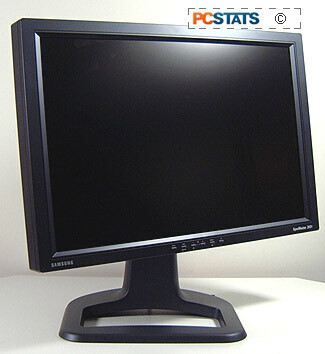 With a sticker price in the region of $2700 CDN ($2230 USD), the Samsung SyncMaster 243T is a high end solution ideally suited for commercial and demanding office applications, or consumers with a very deep pocket who demand high resolution screen real estate for their computing needs. Gamers might not appreciate this screen if they are fixated on pixel response times. Few LCDs compare favourably to CRT monitors for gaming. There are only a handful of 24" LCD displays in existence with the specs and quality of this one, and if you are in the market for a high quality wide screen LCD for computing applications, I do not think you will be disappointed with the Samsung SyncMaster 243T.